Habit: Annual or perennial herbs or small shrubs or small tree or climbers. Stein: Herbaceous; spiny or without spines; cylindrical, hairy. Homogamous: In this case, all flowers are of same kind. Heterogamous: In this case, two types of flowers are present in the capitula. Example: Sunflower. Sunflower has two types of small flowers, disc florets and ray florets. 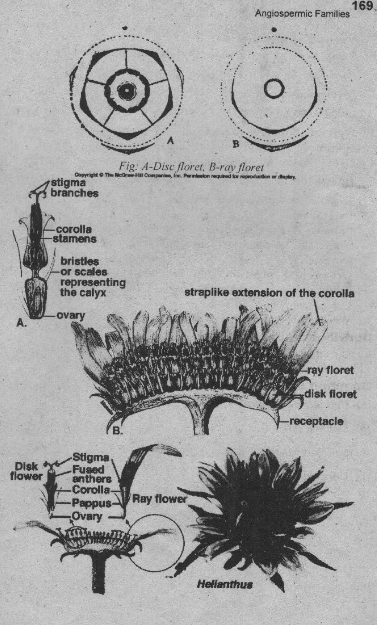 The disc florets are present in the central region. They are tubular and bisexual. The ray florets are present towards the periphery. They are pistillate or neuter. 7. Calyx: .Poorly developed; generally represented by ring of 5 small teeth. They may be present in the form of small scales or hairs or bristles. 9. Stamens: 5 stamens rarely 4; epipetalous; syngenesious (filament free anther united); formitig a tube which encloses style. 10. Carpel: Bicarpellary; syncarpous; stigma bind ovary inferior; placentation basal. Food: Some plants of this family are used as food Sonic of these are lettuce (fsi.–), roots and leaves of cichory. Medicinal: Artemisia yields a drug santonine. It is useful for round worms. Lettuce has properties resemble to opium (rill. Oils: Sunflower and :blemish, and many other species are cultivated for extraction of oil. This oil is used as cooking oil. Dyes: The flowers of C’arlharints linclorhis yield a yellow dye. Insecticide: The flowers of Cluysamhemum (Lop jf) are grounded to produce a powder. It has insecticide called Pyrethrum. Poisons: A large number of members of this family like rag weeds and golden rods cause hay fever. Certain plants are poisonous to livestock. Ornamental plants: Many members of this family are cultivated as ornamental plants. These are sunflower. Chrysanthemum, Zinnia etc. Weeds: Some plants acts as weeds like Sonchus. It is the largest family of Angiosperms. It has more than 1000 genera and 93000 species. ft is distribute all parts of the world. It is complete classification of a family enough for intermediate level. Thanks…It gives to the point information.